Letter to the “Ad”-itor: IT’S THE CLIMATE, STUPID! We have to say we were excited earlier this week to return to our offices to find a telephone message from Bernie O’Neill. O’Neill is an editor at the Mirror newspaper chain, and we had responded to a story in the East York/Riverdale version that quoted our esteemed Toronto councillor Case Ootes (ward 29) ad nauseum. Ootes, it seems, does not like the bikelane that runs through his heart [shurely you mean “the heart of his ward?” –ed.] on Cosburn Ave. The article, by fellow cyclist [donchu mean “typist?” –ed.] Dave Nickle, bent over backwards in its efforts at fairness to his nuttiness, councillor Case Ootes [rhymes with “odious” –ed.]. The travel time along the route during peak periods has increased, by about 10 per cent in the afternoon – 25 seconds – and by 20 per cent in the morning – 58 seconds. Well that sounds like a pretty tough break for Case Carhead out there. Twenty-five seconds? What a slog. What a damn hard row Case has to hoe. Of course, when you put it as “10 percent,” that puts a different light on it. We take back all our sarcasm. You can see how Nickle is trying to make Case Ootes look less like a lunatic with this “percent” analysis. He’s trying to be fair, just in case someone finds out he rides a bicycle. Prior to the bike lanes being in place, 42 cyclists were counted. With the bike lanes, the number of cyclists increased to 94. Case Ootes states he will re-open the debate on Cosburn’s bikelanes in the new term of city council. Where have we heard this before? Oh yes, it’s exactly what he planned before the last election, when he let known his intention to reach into the neighbouring ward and rip out bikelanes on Dundas St. E.
Of course, he failed in that quixotic quest, and it’s safe to say he will fail again, but it’s an odd re-election strategy in the meantime. threat of global warming, and bikelanes make riding bikes safer for everyone. The people of Ward 29 don’t really mind a slower street, one where it’s safer for the smallest and most vulnerable to participate as an equal vehicle in the road, on a bikelane. Is a 28-second “delay” really so bad for people like Case Ootes, and other residents to the east and north, as they rush through Ward 29 in their cars on their way to “somewhere else?” Maybe it’s time for them to try cycling: they may find out why bikelanes make life better. The fact that over a few months the installation of bikelanes on Cosburn has nearly doubled the number of cyclists using it should speak louder than any survey Ootes can wave around. It’s a reminder that people all over Toronto have expressed a desire for safer transport by bikes for work and play, and that the best thing to do is not delay in implementing the rest of the city’s fully-approved bikelane masterplan. It’s past time, in fact, for a bikelane up Donlands to link with the bikelanes on the Overlea bridge and the part of East York north of the Don Valley, and south to the bikelanes on Jones Ave and the lakefront. 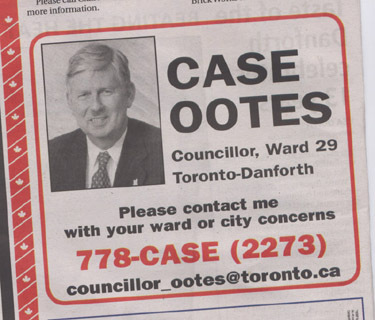 If Ootes wants to demonstrate leadership, instead of reactionary backsliding, let him push for bikelanes on Donlands at the next meeting of council. So this explains our excitement at getting a call from Bernie O’Neill, the Mirror editor. We were happily anticipating the thought of Case Ootes reading the letter and defecating in his trousers in horror. Sick as it may seem, it is also true that just below the snap of Ootes’ leering jowls was a car advertisement. Is there a hint of bright in the day’s sickening news? And we don’t just mean the recall notice sent to 800,000 Ford car owners. The Mirror columnist Joe Cooper, our hero, managed a fairly credible response to the piece, however without once mentioning his foulness’s name. On the issue of the Cosburn Avenue, I use that road on a daily basis (either car or bike) and every time that I do so I see one or more people on bicycles using the bike lane. More importantly, I see people using the bike lanes in the rain, in the middle of winter, at night and all through the day. However, what is very disturbing to me is the absolutely appalling behaviour of some people I have seen using motorized vehicles on that street. I have seen excessive speeding, people passing on the solid line, people passing in parking lanes, and far too many people deliberately driving or parking in the bike lane. This entry was posted on Friday, August 4th, 2006 at 11:40 pm	and is filed under lobs. You can follow any responses to this entry through the RSS 2.0 feed. You can leave a response, or trackback from your own site.